Other news: the manuscript has come back from one pre-press reader already, with far fewer objections than I anticipated and some useful suggestions. At first glance, it may not be entirely obvious how this image relates to the book’s theme. Well, at first glance the image looks like Mars, but it’s really just two kids playing in the desert, so it communicates the idea of not taking things at face value. The kids have their faces tilted up, looking “beyond.” There’s also significance to the fact that they’re wearing spacesuits, in the sense that the body is like a genetic spacesuit for consciousness. More importantly, childhood and playtime are integral to the book’s final chapter and conclusion. Any opinions on this one in comparison to the other attempts? I’ve been spending quite some time scanning through stock images at iStockPhoto, looking for just the right one. Here’s a quick mockup of a useable design. Whether I’ll end up going with this or not, I don’t know. It’s not the sort of design I initially thought I would use, but it’s working for me in a big way. 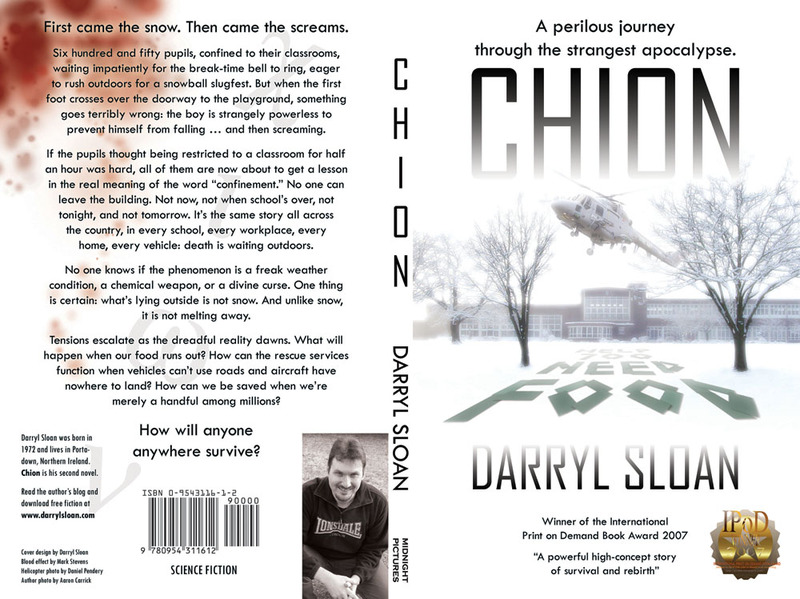 I appreciated everyone’s comments on the proposed new cover design for Chion. I wanted the helicopter to stay, partly because the fly-by related to a scene in the book, but mostly because it gives substance to the purpose of the letters on the lawn, but commenters were right about it being a major distraction. Hence, it’s now a smaller and more distant chopper. The arrangement also provides a nice path for the eye: starting with the message on the lawn, moving into the distance to read it all, reaching the school, then going beyond the school to the helicopter. The old Aliens font is also back (as are the Greek letters, if you look carefully). It’s a nudge in the sci-fi direction worth hanging on to. You’ll notice the back cover has been amended drastically, to gruesome effect. It’s a bit over-the-top, but it was just something I played with and liked. I even wondered if I should swap the front for the back. Nothing like a striking image to capture the attention. However, without the accompanying blurb, it looks like gruesome murder, so the back is where it stays. I’m a perfectionist, and I could fiddle with this forever, but I had to pick a moment and commit. So I’ve now uploaded the new file to the printer and I’m in the process of placing an order for another batch of 250 copies. That will make 750 in print. Not bad going for less than two years. The original cover will still be available until I run out of copies. I have to say, Chion is selling brilliantly. There are times when a week goes past without a sale and other times when I’m posting four books in one day, each to a different address. If anything, the pace has picked up over time. The plan now is to bring my first novel Ulterior back into print. 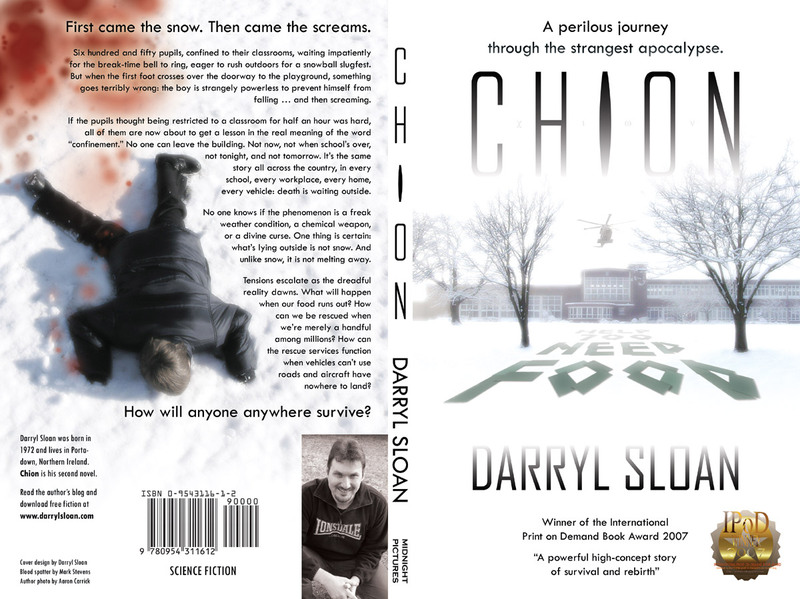 I’m fast approaching the 500 sales mark on my novel Chion, and that’s when I run out of copies. I’ve never been entirely happy with the existing cover, so if I’m going to change it, now’s the time. Here’s my current proposal (please click the graphic for a larger and much more detailed version). Opinions, positive or negative, are welcome and valued. Prior to the book’s publication, the cover design went through several variations. You can have a look at the older designs in my Graphic Design category. Jerry’s excellent design for the Ulterior creature has proved to be a tricky beast to incorporate into other elements of a book cover composition. I’ve done a number of experiments, but not been entirely satisfied. This one came close, but the two images didn’t quite gel the way I had hoped. I got a fresh visual in my head this morning for a different sort of cover, and managed to create it pretty accurately in Photoshop. Voila. Make sure you click through to the larger version to see all the detail. The tag line is tacky, but it was all I could think of at the time, since the existing one (“An ordinary school hides an unearthly secret”) doesn’t suit this picture’s theme. Jerry from Irish Eyes Creations created this wonderful looking beast for a new edition Ulterior that I hope to publish soon. Yes, my first novel will hopefully be back in print again; the fact that I ran out of books before I ran out of demand is reason enough to publish a second edition. But not with that same old cover, oh no. If there’s any weak spot on the original design, it’s the creature’s head. I haven’t got the artistic skills to put together a convincingly professional monster. But Jerry has, as you can see. I think it looks fabulous. Jerry is putting together a full cover design of his own, but he has been kind enough to let me play with the creature, in case I opt for one of my own overall designs. This is a first attempt, based on an early mock-up from last year. There’s a lot of detail here, so make sure you click through to the large picture for the full impact. I intend to do a lot more experimenting (as I did with Chion) before settling on a final design. Hope you’ll share your opinions, as we go through the process. Thank you, everyone who commented on the last cover design. After some more fiddling, I’ve come up with the following “improvement.” James, I think you were right about the Aliens font, after all. To hell with being a copycat; it looks good, and it gives the cover a nudge in the sci-fi direction. I wanted to move the title from the top of the cover to the middle, because the shadowy central section is a bit boring and is better covered. The translucent text didn’t quite work on the more varied constrast of the background, so I had to lose it. And since we’re now back to clear, obvious print, I’m putting the tagline back on again. It’s interesting that no one communicated any particular attachment to the other cover design, the one with the school and the dead kid. Sorry, Eddie (who posed as the dead kid), but the combination of images just never felt like they gelled quite right. I think we’re hitting the nail on the head now. Of course, Mark Stevens, who came up with the “blood on the snow” design, hit it long ago. I think that whatever changes I make from here on in will be small.